They say the best things in life are free, but not in Dubai. However, If you’re prepared to hunt around and negotiate there are some screaming bargains to be found at the Gold Souk in Dubai, an extraordinary find in this desert emirate. Whether you’re looking to buy or not you must make a visit to this market! No human being has ever visited the sun, but a trip to the Gold Souk is about as close as you can get. The souk is a series of shops, each one featuring windows crammed with gleaming, yellow gold necklaces, tiaras, earrings, ankle bracelets, rings, and breast plates. Every type of precious gem is sourced from around the world to create these treasures: emeralds, rubies, sapphires and diamonds. The effect of all these shiny treasures is blinding. The gold trade and the popularity of Dubai’s famous gold souk (or souq, meaning market in Arabic) developed since the 1940s as a result of Dubai’s free trade policies that encouraged businessmen from India, Lebanon and Iran to setup shops in the this desert oasis. 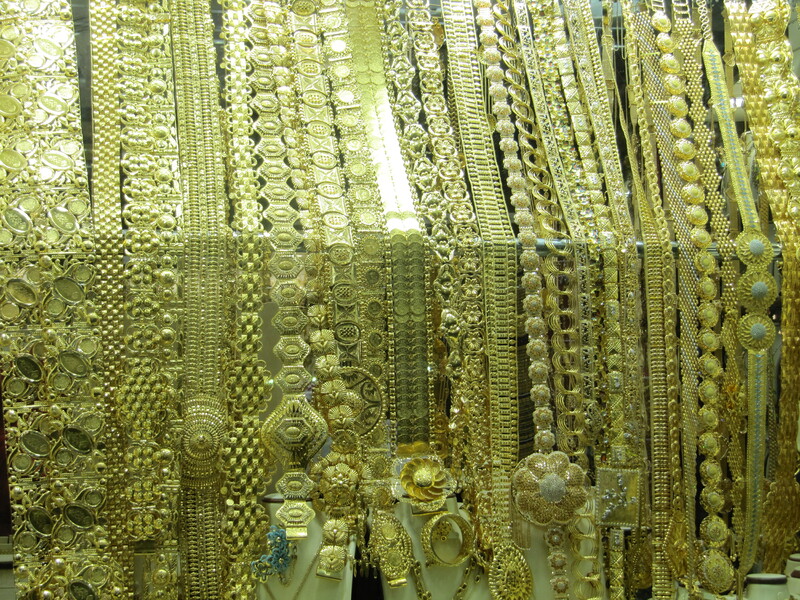 Today, the souk is one of the largest and most famous gold markets in the world. Tonnes of gold are held within this small marketplace andthe government of the UAE imposes strict standards on the quality of gold and platinum products sold within the country. Buyers can rest assured that they are purchasing authentic precious metals of the highest quality. Due to its tremendous number of merchants, their impressive selection of goods and particularly reasonable prices, this immense marketplace is the ultimate destination for jewellery traders, collectors and enthusiasts. Or for people like me who want to see all the shiny gold. Prices are only available upon weighing, so it is perfectly acceptable to go into the shops, ask for a piece to be weighed and walk out to keep browsing. Don’t be timid, they’re waiting for you to ask! Gold is sold by weight but stones obviously drive up the price – you will find many 14 or 18 carat gold gifts and souvenirs within the $40-150 price range as long as you stick to gold and give the precious stones a miss. If money is no option then the sky’s the limit. Remember, if you can’t find what you are looking for, there are plenty of other places to buy gold in Dubai, all the larger malls such as Dubai Mall and Mall Of The Emirates have plenty of jewellery shops selling gold and silver for a similar price. 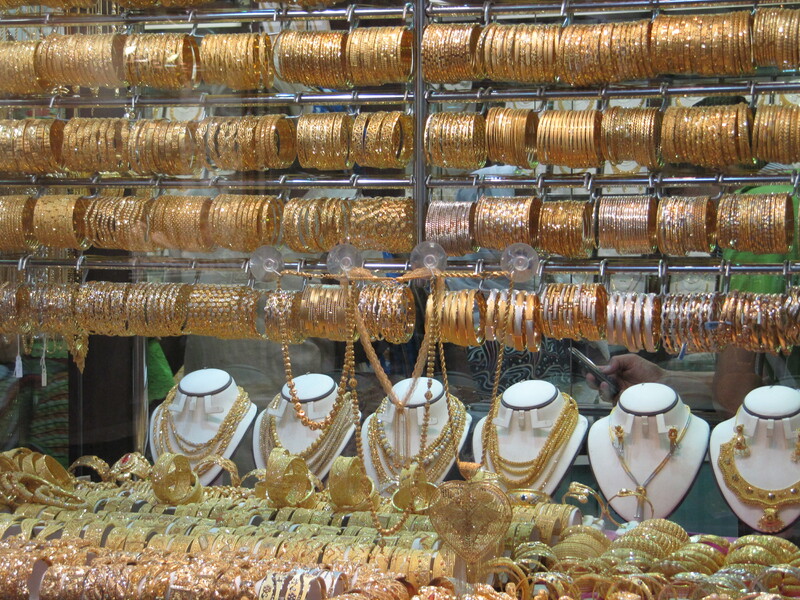 However, for a unique experience and the largest selection, you can’t beat the Gold Souq. The Gold Souq is easy to access and very hard to miss. There is a bus from Union Metro Station that goes to Gold Souq, and a bus from Deira Bus Stand or take the 5-8 minute walk from Palm Deira Metro Station and Al Ras Metro Station. There are probably other ways, but I never take public transport in UAE. I prefer an air conditioned car when it’s 45 degrees celcius. As Dubai is hot and dusty, I recommend taxis if you don’t have a car. Reblogged this on mashehri123's Blog. I’ve been so many times! I just haven’t been in the last few months – I have a plan to get back there! I love the title 🙂 . No, I guess it isn’t that hard to find, but perhaps hard to narrow it down and get your value for money.